Keynote Speakers | Third International Symposium on Computer Vision and the Internet (VisionNet’15) "
Abstract: This talk presents some of the recent approaches for image classification and segmentation. Segmentation tasks are very challenging especially in the medical imaging context. The recent advances in feature extraction and classification makes some of the challenging problems tractable. First a brief overview of some of the recent feature extraction techniques is presented. This is followed by insights into Random Forest classifier. Finally a interactive training application ‘ilastik’ is explained. ilastik provides real-time feedback of the current classifier predictions and thus allows for targeted training and overall reduced labeling time. In addition, an uncertainty measure can guide the user to ambiguous regions of the data. Once the classifier has been trained on a representative subset of the data, it can be exported and used to automatically process a very large number of images. Biography: Maheshkumar H. Kolekar received Ph.D. degree in Electronics and Electrical Communication Engineering from the Indian Institute of Technology Kharagpur in 2007. From 2008 to 2009, he was a Post-Doctoral Research Fellow with the Department of Computer Science, University of Missouri, Columbia, USA. Since 2010, he has been working as an Assistant Professor of Electrical Engineering with the Indian Institute of Technology Patna (IIT Patna). His research interests are in digital image and video processing, video surveillance, and medical image processing. 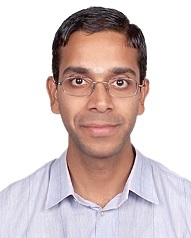 He was a recipient of the Best Paper Award from the Computer Society of India for his research paper. In 2012, he was an Organizing Chair of the IEEE sponsored International Conference on Signal, Image and Video Processing at the IIT Patna, a Guest Editor of the Journal of Medical Imaging and Health Informatics (American Scientific) for Special Issue on Biomedical Signal and Image Processing, a Tutorial Chair of the 4th IEEE International Conference on Intelligent Human Computer Interaction at IIT Kharagpur, a Keynote Speaker of the International conference on Biomedical Systems, Signals and Images at IIT Madras, an Editorial Board Member of the American Journal of Signal Processing (Scientific and Academic). In 2014, he successfully organized Special Session on Intelligent Video Surveillance Systems at the International Conference on Systems Engineering, Las Vegas, NV, USA. Talk description: Human Visual surveillance is one of the most active research areas in computer vision. It has a wide range of promising applications such as human identification, crowd flux statistics, monitoring and detection of abnormal behaviors. The general processing framework involved in video surveillance is modeling of background, motion detection, tracking, and recognition of actions. In this talk probabilistic approach based on Hidden Markov Model and template match approach based on Motion History Image will be discussed for recognizing activities such as walking, running, bending, clapping, hand raising, hand waving, baggage drop, baggage exchange. Unattended objects are major threats in railway stations and airport. Detecting unattended object and tracking the person is one of the major concern and often difficult to detect in crowded scenario. Human motion analysis helps in solving many problems in indoor surveillance applications, patient monitoring systems, and a variety of systems that involve interactions between persons and electronic devices such as human-computer interfaces. Most of these applications require an automated recognition of high-level activities, composed of multiple simple actions of persons. The ability to recognize complex human activities from videos enables the construction of several important applications. Applications of surveillance systems will be discussed for public places like airports and subway stations.